Hell's Mouth Surf School continues to offer the best quality, fully qualified, insured and regulated surf school on the Peninsula. We have been giving surf lessons since 1996 and have helped thousands of people with their first surfing experience. We use International Surfing Association accredited coaches to guide you from absolute beginner to competent intermediate. 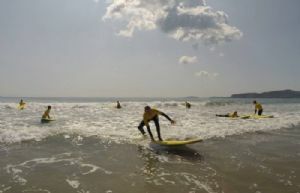 The surf school runs from April to November. We teach mostly at weekends but every day through the school holidays. Mid week lessons can be arranged at any time with three or more people. Hell's Mouth Surf School Ltd is run by and through West Coast Surf Shop. International Surf Association qualified instructors will teach groups of up to 8 people. (With the demise of the BSA, instructors are now qualified as International Surf Association trained coaches and maintain the same high level of qualifications and competence). Individuals, over 8 years old, can join a scheduled lesson or friends can take as many places as they require. We restrict group size to 8 per instructor but have access to 2 freelance instructors. Wetsuits and foam 'Swell' surfboards are used and included in the price of £35 per person. Lessons last 2 - 2 1/2 hours and registration/wetsuit fitting is at West Coast Surf Shop in Abersoch prior to you making your own way to the beach. We can also send lesson gift vouchers that can be used at anytime through the season. E-mail surf@westcoastsurf.co.uk or ring the shop on 01758 713067 for more information or provisional booking. If you would rather just hire equipment: We hire surfboards out at £10 per day or £35 per week and wetsuits are £8 per day and £25 per week.